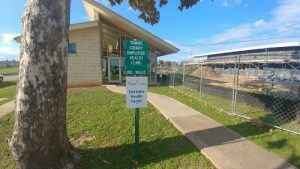 Located at the Travis County Employee Wellness Center, the Del Valle Health Center opened Nov. 20, 2017. The opening of the new Del Valle Health Center is considered an interim solution—with plans for a larger, permanent health center on adjacent property. The center offers medical care and behavioral health services. Hours: Mondays, Tuesdays, 8 a.m. – 7 p.m., Saturdays, 8 a.m. – 5 p.m.
For information or to make an appointment, call: (512) 978-9015. Services are offered by CommUnityCare Health Centers, the Travis County Health & Human Services Department, and Integral Care. We are thankful to Travis County for allowing us the use of space. Clinic Type: Permanent health and wellness center including clinical services, in partnership with Travis County Emergency Services District (ESD) 11. Services: Partners are determining the scope of services that will be provided at this location. Days/Hours of Operation: To be determined. A permanent health center is projected to open in 2021 on adjacent property next to the Travis County Employee Wellness Center. The plan includes a 5,600-square-foot site with the potential for multiple floors. Clinic Type: A mobile health clinic, which is a customized bus with two built-in exam rooms and other medical equipment. Services: Primary care, preventative, vaccines, on-site lab, chronic disease management, limited pharmacy. Non-clinic services could include eligibility services provided by Central Health, and transportation services to the clinic site by the Community Care Collaborative, Central Health’s nonprofit partnership with Seton. Days/Hours of Operations: Two days per week (days to be determined) from 9 a.m. – 4 p.m.